Now the fun begins. Three more films add themselves to the Christmas week slate over the next three days, adding to the Holiday glut that started last Friday and was added to with three films on Wednesday. In all, as many as ten films could be significant players over the next week and a half. First, the new arrivals. 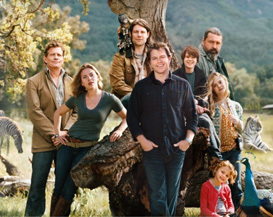 Friday brings Cameron Crowe's first film in six years, We Bought a Zoo. One of the odder premises in some time, it stars Matt Damon in an adaptation of Ben Mee's autobiographical book about his family's purchase of a rundown zoo in the English countryside following the death of Damon's character's wife. Annnnnnd that's pretty much it for plot. It's not going to get much plainer than the title, there. Scarlett Johansson, Thomas Haden Church, Patrick Fugit and Elle Fanning round out the cast, though the appeal is Damon plus a bunch of cute, cute animals. This is filling the Marley & Me slot of “family film with animals”, which fairly inexplicably dominated the 2008 Christmas season to the tune of a $36 million opening and $143 million total. Jennifer Aniston chasing an unruly Labrador puppy down the beach is apparently just what people wanted. There's a significant difference here in that this book wasn't nearly as popular as Marley & Me, and that we're losing focus on a particular animal for the multiple ones in the zoo. Porcupines-lessthansign-puppies, apparently. Hopefully we can count on a bit more insight from Crowe than David Frankel on the therapeutic value of animals, but I don't know that that's going to help on the first weekend. I'd look for an opening weekend of $19 million.